Born and raised in the village in rural Kenya, Dinel’s parents struggled to feed their three young children. Despite their difficult financial situation, they did their best to make sure that she was able to get through primary school. Although, school fees were not always paid, the school principal realized her determination to do well and kept her in school until she was able to complete the 8th grade. At that time, she sat for her national exam to qualify for secondary school. 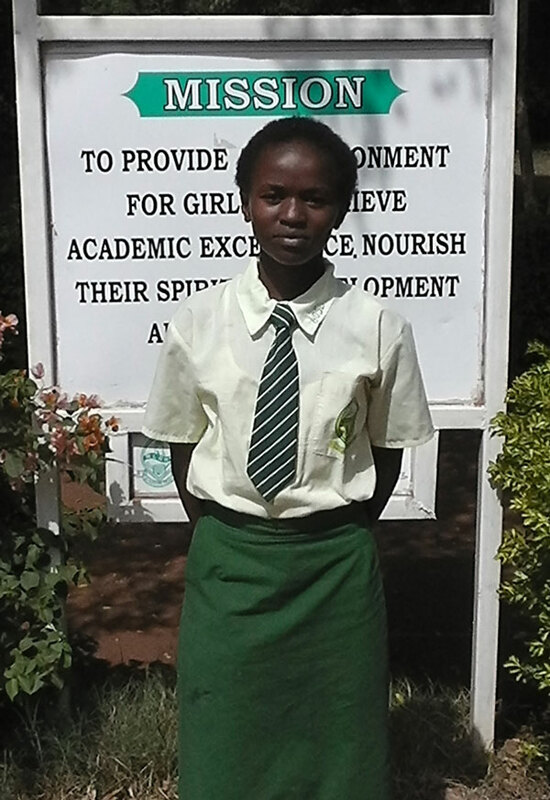 She passed her examinations very well and earned acceptance at the Mary Leakey Girls High School, earlier this year. Unfortunately, her parents had no way of funding this education and were at a critical crossroads on how to move forward with her education. She stayed at home for the first month after the other students had joined secondary school. Her hard work had only earned her good grades but she still had no hope as to how she’d be able to move forward with her education. A good neighbor once gave her work as a laborer in her farm and realized how young she was. She was set to earn $1.50 Usd per day and this was to be the life of this young determined girl. The neighbor was touched and asked to know her story. She mobilized enough money to buy Dinel some of the required school items and part of the school fees. Her parents accompanied her to school with her few belongings and she was accepted. She had a lot to cope with a lot of new things as part of this transition – from the use of Swahili and English language for communication, making her bed in the mornings, brushing her teeth with a toothbrush, polishing shoes and other things deemed as basic. Unfortunately, not enough money was raised by this kind neighbor, so Dinel was sent home for a month without school fees. Despite her situation and difficult transition, she was able to make good grades. As a result, the school management reached out to Moja Tu asking for us to help assist her reach her full educational potential. After a visit to Dinels home we were able to confirm just how deserving her situation really is. Her parents have hope in her that she will be the one to take them out of poverty. Her determination to attain the highest score is evident. If supported, she has a very promising future and the number of people she would be able to impact through this opportunity would be great.